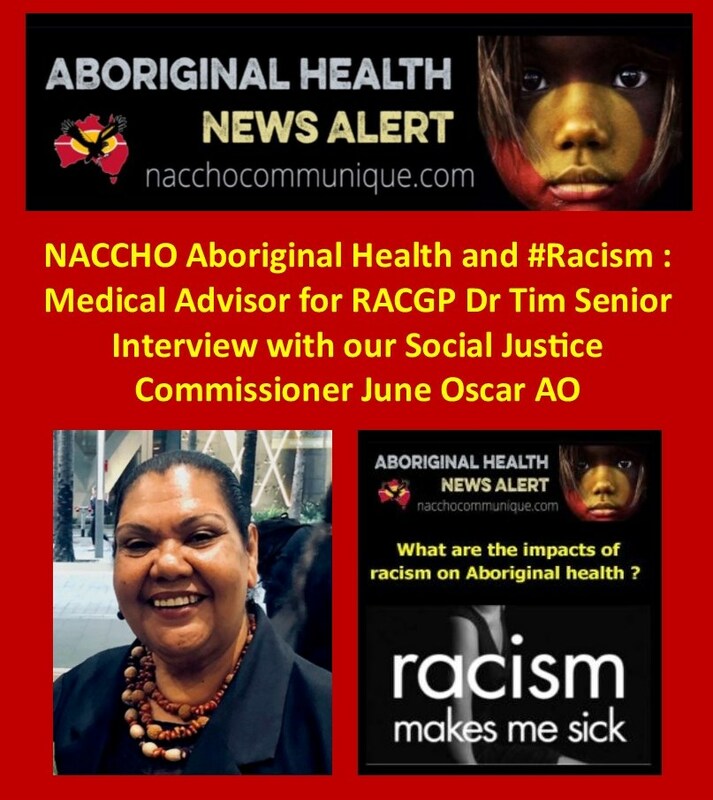 NACCHO Aboriginal Health and #Racism : 1 of 2 Medical Advisor for @RACGP Aboriginal and Torres Strait Islander Health, Dr @timsenior discusses racism in healthcare with our Social Justice Commissioner @June_Oscar AO. ” The fact there remains a significant health gap between Aboriginal and Torres Strait Islander peoples and non-Indigenous Australians is indisputable. The reasons behind this are complex, multifactorial and often uncomfortable to discuss, but one factor that may be the most difficult to raise is the presence of racism within the Australian health system. However, there is increasing evidence, drawn from the lived experience of Aboriginal and Torres Strait Islander peoples, that this form of racism is a barrier faced every day. Dr Tim Senior : The RACGP has recognised the situation in its Racism in the healthcare system position statement, and recently I was also able to discuss these issues with Aboriginal and Torres Strait Islander Social Justice Commissioner, and Bunuba woman from Fitzroy Crossing in the Central Kimberley, June Oscar AO. 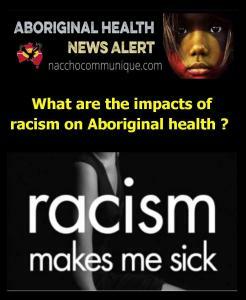 One such example is the recent online survey conducted by the Victorian Aboriginal Community Controlled Health Organisation (VACCHO), which found that 86% of its Aboriginal and Torres Strait Islander respondents living in Victoria had personally experienced racism in a mainstream health setting. Of those polled, 88% reported incidences of racism from nurses and 74% from GPs. When working towards closing the healthcare gap, this is a barrier that cannot be ignored. I’d like to start by asking, how does racism affect the health and wellbeing of Aboriginal and Torres Strait Islander people, and what does this mean for their everyday lives? Well, from what I’ve heard with a project I’m leading across the country engaging with Aboriginal and Torres Strait Islander women and girls in this past year, [Wiya Yani U Thangani­ (Women’s Voices’ project)], and what I already know from engaging with communities before coming to this role [Aboriginal and Torres Strait Islander Social Justice Commissioner], experiences with racism are just all too common. Thank you to the women and girls who came along to our Wiyi Yani U Thangani (Women’s Voices) session in Woorabinda . Thank you for taking the time to be part of this national conversation, a first in 32 years with our women. Your voices will join those of First Nations women and girls around the country in my first report to Federal parliament. I’ve heard the terrible experiences Aboriginal and Torres Strait Islander people have when they visit health services. The manner in which they’re spoken to at the first point of contact in the service, and the way they’re treated and spoken to by health professionals, whether they be nurses or doctors. And I’ve heard that concern coming from people in remote, regional locations, and cities where there’s major hospitals and services. So it’s widespread, it’s a huge concern, and it is something we have to address. What do people say is the effect on their health? People feel they’re not able to access a service that they have a right to access. What they’re made to feel is that they shouldn’t be there, that they’re not being believed, they’re not being acknowledged in a respectful way. And so people are not wanting to be in that space, and that makes them feel terribly unwell on top of their state of health and wellbeing at that time. To be treated like that is not a very nice feeling, so people often leave health services without seeing anybody. So people are made to compromise their health and wellbeing because of an attitude and a way of communicating and interacting – and often it is non-Indigenous people that are at the other point of this contact. Can you tell us what stories you’ve heard through the Wiya Yani U Thangani­ (Women’s Voices’) project? I’m hearing comments like, “We’re sick and tired of going to services when we need to see someone about a genuine concern about our health, only to be spoken to in an unwelcoming, uncaring manner”. To see health professionals that issue Panadol without assessing and conducting full observations of the individuals presenting. And so people are turning away, and being turned away, from quality of health assessment and diagnosis – which is their right in this country. How can we start a conversation about, or continue a conversation about, the realities of racism in Australia? I think services need to screen the types of people who they are recruiting to these roles and place the onus on them, because they are at a critical point of service delivery. So if they’re seeing outpatients and are the first point of contact for people coming in to the service, there’s a standard at which we want them to be operating, and policies and a scrutiny of how they are conducting themselves in this role. We have seen in many places that there are people who have been in these roles for a long time and hold these types of attitudes that Aboriginal and Torres Strait Islander people are experiencing. We can involve Aboriginal and Torres Strait Islander people and organisations, particularly the community-controlled health organisations, in recruitment, and setting the recruitment protocols in places where there is a high population of Aboriginal communities and likelihood of people accessing the health service. We have to involve Aboriginal and Torres Strait Islander people in the design of service delivery. Are there any other options that primary healthcare organisations can take to support their staff and patients to challenge racism? I think organisations can improve on how they ensure that [Aboriginal and Torres Strait Islander] people are accessing their right to quality healthcare service and delivery. We need to have people involved in the organisations that are listening to and incorporating the advice of Aboriginal members involved in that process. How can clinicians better support their local communities and strengthen their abilities to deliver culturally appropriate healthcare? I think many of the clinicians come from other places to live in these communities. They need to be aware of the communities and be informed, educated and orientated to the community, the environment and what the issues are. They need to be made aware of the efforts and the history of these communities, and the long struggle it has been for Aboriginal and Torres Strait Islander people to establish these services, and know that they are not alone and disconnected in a community – they can access support if they have a question, or don’t know quite how to respond. I think if we can establish stronger networks and relationships between health experts going into a community that they have no idea about, then the onus is on them to be informed well in advance before they get there. And once they’re in the community, they should seek out the supports that exist within the community. Is there any other advice you have for GPs or practice staff? GPs and health professionals need to know that people have a right to access these services; they don’t have the right to deny them access. As citizens of this country, Aboriginal and Torres Strait Islander people have a right to these services.